This is our dining room. You can also check it out on rate my space. and #3. I am leaning towards this one because it is the lightest and I think would work well with all the green accents I have in my home. If you have any ideas, pls. send them my way! Thanks!!! I'm with you on #3 - it would look great there! I love them all but I think #3 is THE ONE! 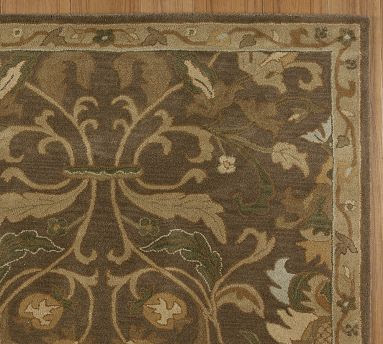 Here is something new to try...there are great new designs in indoor/outdoor rugs. Try www.ballarddesigns.com....you can get a 5x7 for as little as $89.00. I have had a leopard print one under my dining table for about five years and it looks as good as the day I bought it. You can vacuum it like any other rug. Spills wipe up with a damp cloth. They are usually made out of a polypropelene and do not absorb spills. The price is right, the patterns are great, they are easy to maintain AND you can use it on your patio when you want to change it. 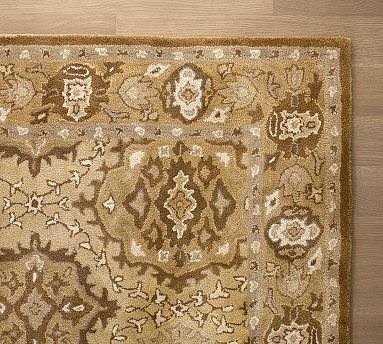 You can also find them at overstock.com sometimes or in the Grandin Road catalog and many other places...just google indoor/outdoor rugs... You might be surprised at the great selection of patterns you will find!...and the great prices!!! Or check out this cream/green one...from Ballard Designs. ...and NO I don't get a commission!! Ha Ha...just love the product!! I love #2. I like the creams and the bit of green it. I like #1 too, but I am not sure, #3 is nice too, but if you it's alittle too subtle esp coming from cow print and zebra print. Oh no I am going with No. 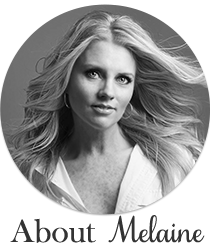 1.....I love that Melaine!!! Super cute. I can't believe you don't like the zebra....LOL (just like me). I like #3, but I am always drawn to neutrals/black/whites...What does your zebra rug look like? I like rug #3! But it's ultimately your choice. I personally love # 1, but #3 is more classic and may have more staying power. I like the 3rd one as it goes with your black furniture. #3 is my favorite. I like that it is a little more neutral and can go with more. Good luck! p.s. Hope you are feeling better soon! Well, if I was in a different situation right now I would buy that Zebra rug up in a heart beat. LOL But I guess I need to be a good girl. Darn! I like #2 love cream and greens... I am looking for a zebra print rug brown and creams for my studio/office. Love your blog. 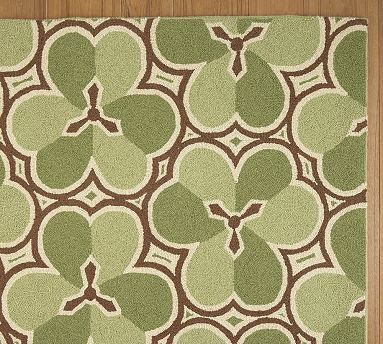 I am a huge fan of Dash & Albert rugs - the colors are wonderful - great quality and a great value. I have a Dash & Albert rug under my dining room table. I order it from www.laylagrace.com. I realize this is a totally different look than the options you have posted but something to consider. Good luck! Oh, another thought - I don't know about you but I have never LOVED the quality of Pottery Barn rugs - especially under a dining table. I like #2..I don't think you will get sick of it and it appears pretty transitional. #1 you would be committed to that specific color and #3 looks a little southwestern to me. I agree I would give Ballards a try as well. I like the Third as well! Yes #1 is a commitment but since you seem to like to change things around a bit I do have to say I really like it! It would work so well in the dining room and then if you ever change your mind it's got such good color to re-use in other areas. That color green is so soothing to the eye and uplifting! However if I was going in the safe zone #2 would be my preference because it's a little darker in color and wouldn't show much in the way of stains... Plus I just prefer the design on it over #3. There is my two bits! :) Good luck! At least you have it narrowed down! I have the hardest time doing this type of thing! IMO #1 is too modern for that room, although it is very cute. 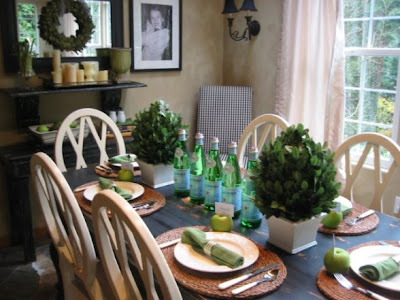 #2 or #3 are my favorites, but I also like the idea someone had about a sisal/seagrass rug! I like #2. It has that great little punch of green. I love that green! It just brings life to a room. Love the bog-just found it this week!